The Solar Eclipse was an important event this summer, it was hard to escape. Every magazine, newspaper, or local tv show was talking about it and the fanfare leading up to it. I had never seen a total one, only a partial one and that was cool enough for me to want to see more. It was August 1999 and I was in Paris with my family on summer holiday. I remember it was raining that day, as it often does in Paris. We were in the Marais and everyone came out of the shops and bistros and was just standing in the streets, gawking at the sky. 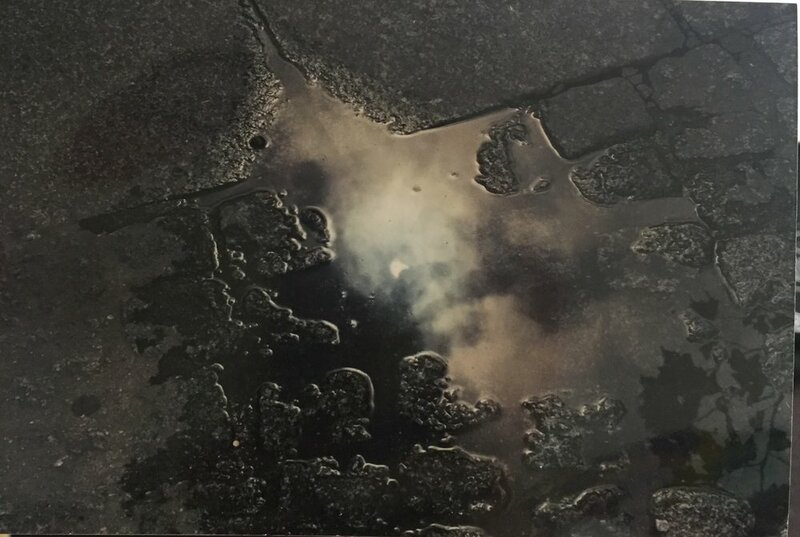 Since you can't look at the sun directly, I took a picture of the reflection of the eclipse in one of the rain puddles on the ground. This was back when you took pictures on a camera and waited weeks to develop them, unsure if you would actually get the image you wanted to take, with no second chances. Partial solar eclipse in the Marais. Paris, August 11, 1999. Partial solar eclipse 3rd arrondissement (Marais) Paris. View of partial eclipse in rain puddle. Marlborough girls are exceptional women: Class of '92, '94 and 2021. Photo by Matthew Clark. My husband, who grew up in Paris, set out on a week long bike trip to the countryside of France with his uncle, father and cousins to see the total eclipse, unencumbered by all the lights, noises and pollution of the city. He enjoyed it so much and has talked about it many times over the years, so he began preparations for our trip about nine months prior and was really anxious that we had to be in just the right spot. Over the course of 1 hour and 32 minutes, the Great American Solar Eclipse would move from west to east in a path of totality across 14 states before ending near Charleston, South Carolina. We were originally going to go to Oregon, the longest of the totality and the initial starting off point, but that booked up too quickly and even a motel 6 there was $1000 a night! Next we looked at Nashville, to stay with friends, when that fell through we debated Nebraska. My mom is originally from there and we thought it might be interesting for Dries to experience some real Americana. We decided on Sun Valley, Idaho, a close family friend had moved there a few years back and had just moved into a house with plenty of room for all. 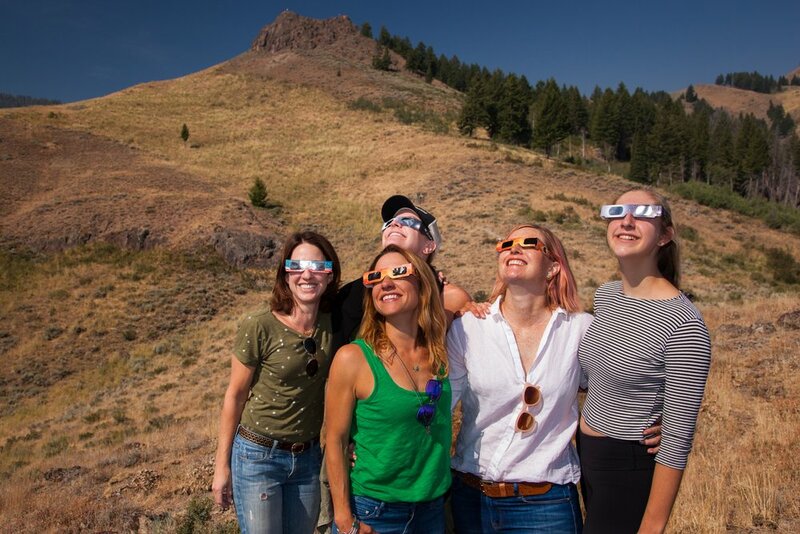 Hiking up the mountain to see the eclipse in Hulen meadows Sun Valley, Idaho. After much anticipation, the day of the eclipse arrived and we were ready for it! 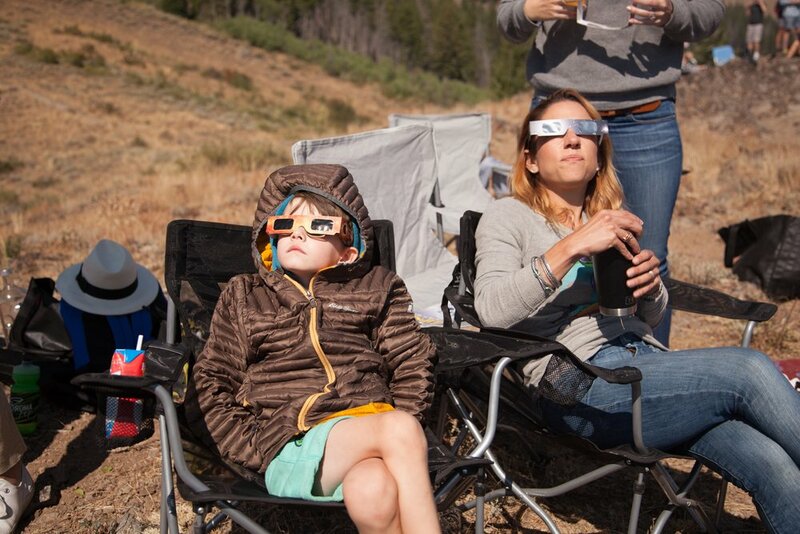 We packed picnic blankets, chairs, warm sweaters (the temperature dropped about 20 degrees within minutes) and festive drinks and snacks along with our all important eclipse viewing glasses. 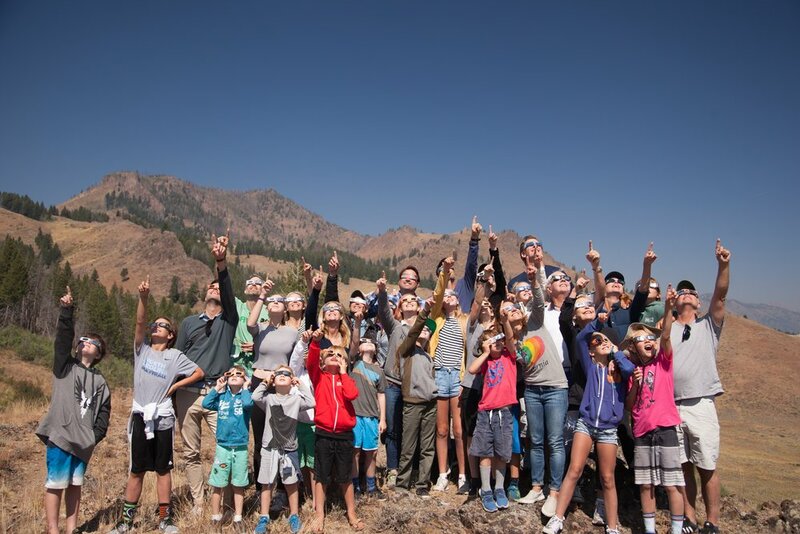 We hiked up through the meadow and up a nearby mountain to enjoy an impressive view of the total eclipse. If you need to brush up on your astronomy, a total eclipse is when the moon lines up with the sun and Earth, briefly blocking the sun and creating a momentary impressive darkness. Only the sun's radiant atmosphere (known as the corona) can be seen during this short time. Approximately 71.45 miles at its widest point, totality lasts longer towards the center of the path, so the closer you are to the center line of the moon's shadow, the more time you'll have to experience. I spoke with some other eclipsers who were closer to the center of the path in nearby Stanley and they saw over 2 minutes of totality. The longest duration of totality was in Carbondale, Illinois with 2 minutes 40 seconds! In Hulen meadows, we were just at the edge of totality, with the partial phase beginning at 10:12:39 AM, and totality beginning at 11:29:38 AM for a duration of 1 minute 4 seconds. Temperatures dropped fast, Dries and Ashley watching the partial eclipse. Photo by Matthew Clark. Of course, we have mother nature to thank for this total unobstructed view. After a preliminary meteorological report predicted clouds, we were fortunate enough to have perfect weather. Not everyone was that lucky. My sister went to Nashville and right at the moment of totality, a big cloud moved in the way and partially blocked the view! Thankfully not the whole time but for at least half. There was another eclipser at our vantage point that told us that this was his 12th total eclipse trip with only 2 actual sightings due to tempermental weather conditions. Now that's dedication. Total Eclipse photo by Ryan Gates. A total eclipse is truly something special to behold. There were around 30 of us, several families, dogs, kids, grandparents up on the mountain all experiencing this cosmic event together. The magic lies in that for a few minutes, everyone stops what they're doing and looks up to the sky to marvel at the beauty of nature, remembering that there is more than just us. Forgetting about the negativity we are bombarded with on a daily basis and instead reveling in this ethereal, transient beauty. Providing the hope for a mental shift or transfer of energy as it passes and our routine lives resume. To possibly be kinder to one another or just a little more patient. To be present in the moment and thankful for the limited time we have here on this planet and with each other. To be with family and friends at this significant moment in time, creating an enduring memory to cherish. Group photo by Matthew Clark. According to NASA, since 1503, there have been 15 total solar eclipse paths that have crossed the path of this Great American Solar Eclipse. The next total solar eclipse that will cross the US will be in 2024, crossing south to north. Time to start making travel plans! Avalon Harbor, Catalina Island. Boats, paddle boarders and swimmers abound! 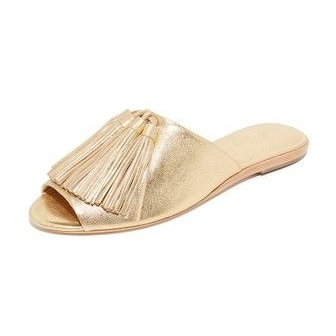 This summer I'm all about weekend trips and short getaways. My next door neighbor, now friend, grew up on Catalina, and invited me home with her to experience another side to the island. Previously, I had only thought of it as a summer tourist destination or for sleep away camp. 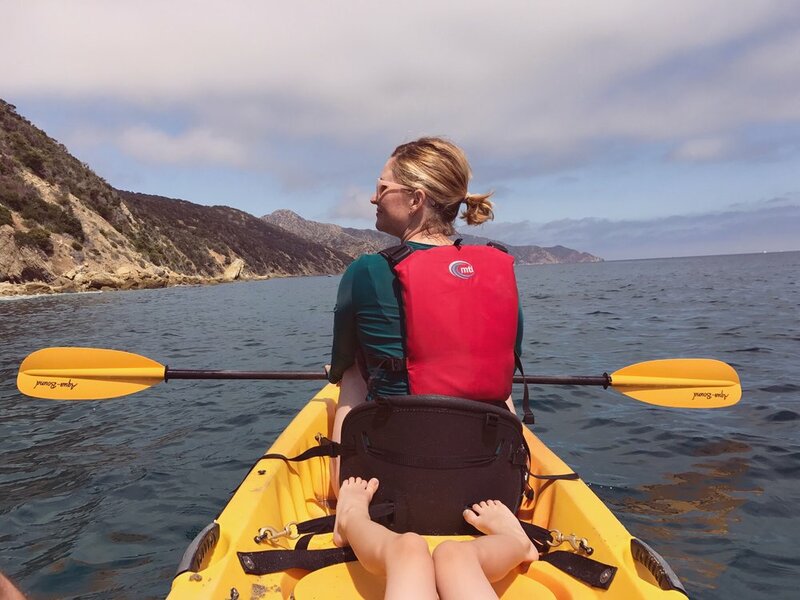 I hadn't visited Catalina Island since ninth grade on a sleep away trip with high school and my husband and son had never been so it seemed like the perfect opportunity. 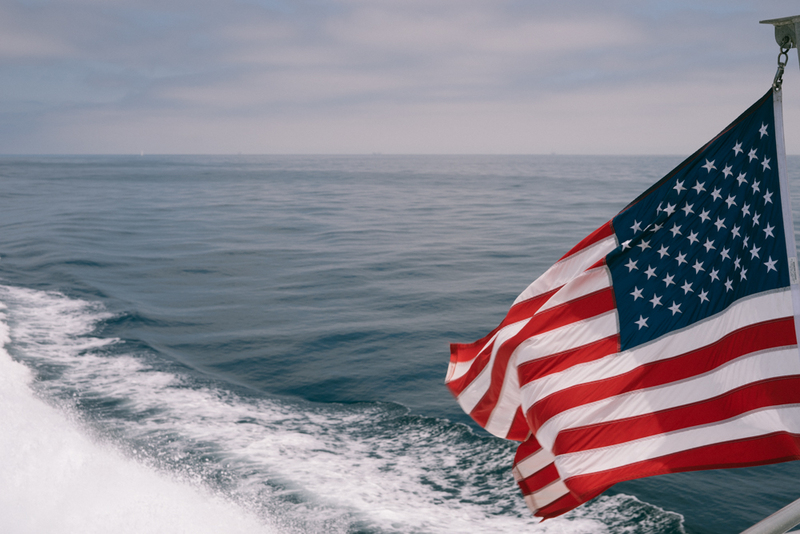 To get to Catalina, you take an hour long ferry ride from several ports in LA. The closest one for us was Long Beach so we departed from there on a Friday afternoon. Cars are restricted on Catalina, with a wait list as long as 20 years +! So the ferry is only for people and dogs (either caged or in muzzles). We took our dachshund Junior with us, he didn't love the ferry but he did pretty well overall. Once there, you can walk around the main city part of Avalon on foot or rent a golf cart or bike. I had never driven a golf cart before and was surprised to find it was a blast! My son loved it too and would tell me to "Hit it!" and we would blast down the road. A golf cart's engine is similar to a lawnmower so by blast I mean when we were chugging up the hill, you could probably run alongside us. 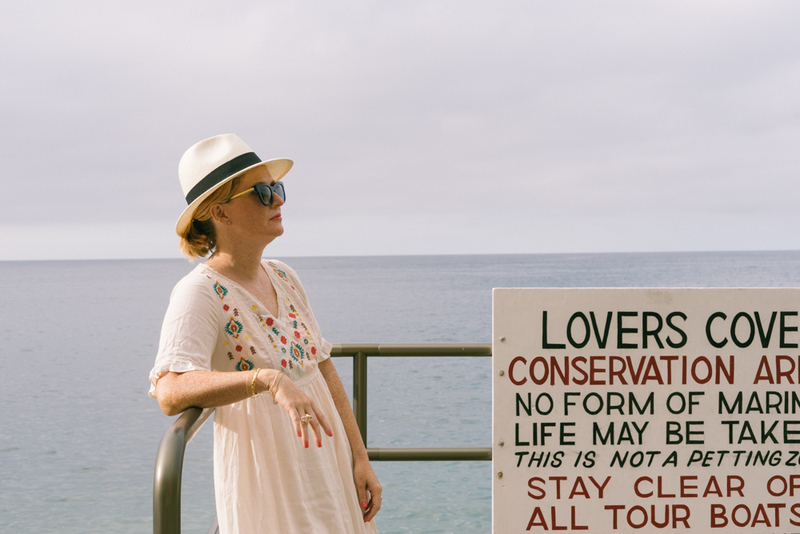 One of my favorite things we did was swim at Lover's Cove. Dries had fallen asleep and Raf and I snuck out for an hour to tool around in the golf cart, exploring the city and to take a dip in the water. It's been so hot lately, it felt great! The water was a little cold at first but instantly warmed up. Catalina's rocky coastline reminded me of Sardinia where we honeymooned because it too is mostly rocky beaches. Pro tip: Don't forget the water shoes, you will want them! The current was pretty strong the weekend we were there and some of the beaches (Descanso) had sharp rocks but Lover's Cove had really smooth ones which also made them a bit slippery. My friend Katie prefers Pebbly Beach, but there was a construction site nearby to it so we opted for Lover's Cove. You be the judge! My plastic Eva birkenstocks were no match for the rocks at Lover's Cove! The next day we did Descanso Beach Club, which is Catalina's version of a family friendly Miami Beach. They have a DJ on the weekends, and a section that has cabanas and beach chairs for day rental and an outdoor café & bar (that will also serve on the beach), a smoothie & ice cream shop, and a shop that sells pool floaties, paddle ball racquets, hats, umbrellas and all with decent prices. The day we were there, the private section was sold out so we just sat on the public beach part, immediately adjacent to it. It was just fine, the restaurant brought us our fish tacos, fries and margies and everything was alright with the world. Descanso Beach Club. Janna Conner Aleeza rock crystal ring, Catori brass cuff, 14k gold initial bracelet. There are a lot of boats docked in the harbor and you can swim up in one section, another is reserved for kayaks, jet skis and paddle boards. Dries wanted to kayak so we rented a two person one with Dries sitting in the middle for an hour. Once he got over screaming "Oh nooooooooo, we're going to die, this was a terrrrrrrible idea!" he actually enjoyed the last 15 minutes or so. It was lovely out on the water, sunny but not too hot and with no waves. The next day we headed into the hills, which requires a car (no golf carts there!). We winded our way up and around, passing the zip line station that goes all the way down to Descanso and then paused for a moment to admire some bison and heron at Haypress reservoir. The bison were brought to the island in the 1920's for a movie, but were never used and then left on the island because they didn't want to deal with taking them back. Not very nice. Now they casually wander the island. We saw one just chilling on the side of the road, minding his own business. We stopped at the Airport for lunch at DC-3 café and gift shop. It's very scenic high up with all the little planes flying in and out. Some of the famous pilots that have flown in include Angelina Jolie and Harrison Ford. It's not for the weak of heart, the runway is only 3000 feet! I think I'll stick to driving up for the food, I had a great salad and Raf had a buffalo burger. No meal is complete without one of their killer homemade cookies, the oatmeal peanut butter chocolate chip are delicious. They also sell Rusack wine, wish I had a bought a bottle because it seemed a good price at $30 since Rusack isn't that easy to find, at least in LA. I didn't though because we were on our way to do the Trans Catalina trail and didn't think it was a great idea to keep the wine in the car. Oh well, next time! With full bellies, we continued on our way to Little Harbor, the starting point for our afternoon hike along the Trans Catalina Trail. Little Harbor was largely deserted except for a few campers, (there's a nearby campground) it was perfectly peaceful. The Trans Catalina Trail stretches 37.2 miles across the island, seemingly never ending but we did just a portion of it since we had Dries and Junior, our mini dachshund with us and we wanted to get some beach time in. It wasn't difficult, and provided lovely vistas along the soapstone path with striking red flowers. Trans Catalina Trail from Little Harbor and Whale's Tail Catalina Island. Unusual red flowers everywhere along with cacti. 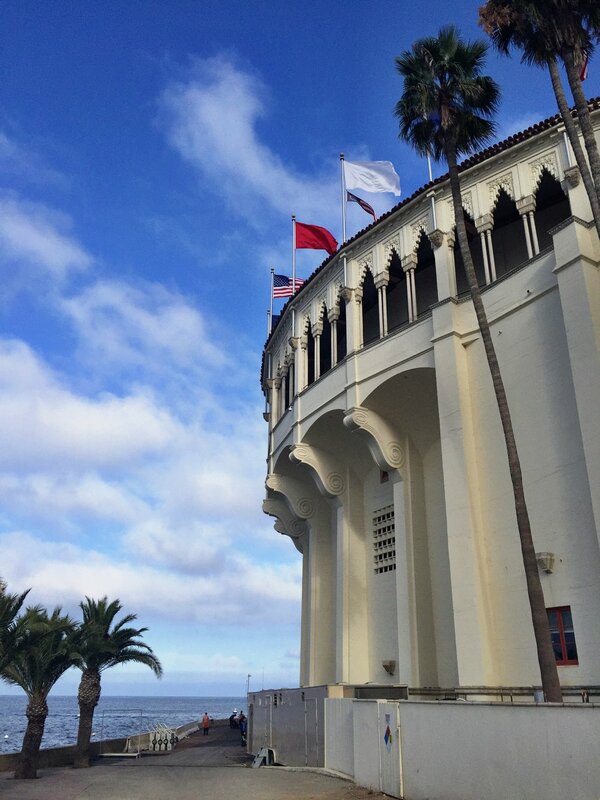 Catalina makes for a great weekend trip, or longer. They have great camps for kids and many scenic options for both the casual traveler and camping options for the outdoorsman. Now that I've done part of the TCT, I think I would like to try doing the whole trail! I had seen a lot of images of 14th Factory popping up on my Instagram feed when it opened in Spring. For one reason or another, I wasn't able to make it until earlier this month. Since it was late in its run, I wondered if it would be worth it or if it was another Museum of Ice Cream type of expensive selfie photo op. I decided to go and I'm so glad I did. It's closing at the end of July, so make your way there as soon as you can! The outside of the factory is painted black with giant Chinese characters and black and white flags hanging outside the entrance, imparting the foreboding feel of a pirate ship. (I have a 5 year old son, so we see Pirates everywhere these days) I love that it's in Lincoln Heights, a peaceful, industrial neighborhood I often drive through on my way home. Once inside, there are 14 rooms showcasing mainly Simon Birch's work, the British born, Hong Kong based artist who is the founder/creator of the 14th factory. I spent my Junior year abroad in Hong Kong, and haven't been back since so was excited to see this little bit of Hong Kong brought to LA. Los Angeles was not the first city envisioned to be the home of 14th factory. 5 other cities were previously in the works, the most recent, New York City, but with all other cities, the project was about to open to the public and they either lost their funding, permitting etc, so this installation has been years in the making and very much a labor of love. Supposedly two of the pieces in the factory were sold to LACMA, so it seems that there really was a happy ending after all. The site selected for 14th factory LA is huge; 3 acres in total in a former warehouse, making it the largest experiential art project in LA. When I visited, they were in the process of filming a documentary for the BBC, and hoping to have the next site take place in London. This whole project is like a rotating mini museum that is entirely funded by ticket sales and donations. There is no guided tour as you walk through the space, and because of its size it can be a little confusing and overwhelming at times. Birch's intention was that it be an informal space for viewing art in a casual setting rather than the conventional museum going experience. He often gives talks on site and has other collaborative, interactive events with artists on the weekends. What was the most famous room in the factory (that is until the crown room selfie fiasco) is a replica of the room from the last scene in Stanley Kubrick's 2001. The light up floor emanates a lot of heat, each group of 4 or so has 2 minute to walk through, without shoes on and experience it. It's gimmicky for sure but still pretty cool to experience. Garlands by Simon Birch, Lily Kwong and KplusK associates. Next up is an interior courtyard, filled with grass. They had just replaced it the evening before. Even though the ceiling is perforated, with the extreme heat of LA summers, the grass just couldn't survive very long. There were a few swings scattered throughout but we were told not to step on the grass because it had just been put down. With nobody on the grass it seemed like a haunted idyllic playground. In the Garlands hall there are 10 photographs by Li Wei with various people suspended in mid air. They were shot with the subjects on cranes and in some you can see the expression of the crowd as they look at the people flying in front of them. Upclose of The Crusher by Simon Birch, 300 wood and steel painted pitchforks suspended from the ceiling. Acrylic paintings by Dominique Fung, The Inhabitants. Closeups of vegetables in various stages of decay. One way we've found to keep our son actively engaged while looking at artwork is to give him a camera to record his own view of the art. It's fascinating to see the angles and compositions he comes up with. We also discuss what's going on in the piece, be it the subject matter, technique employed, setting or materials involved. Closeup of the audience watching of The Inevitable By Eric Hu and Simon Birch. The video of a vintage Ferrari speeding and crashing, flipping over and over until it's destroyed feels hypnotic and voyeuristic, it's hard to look away from. I'm not personally a big car fan, but I can imagine that this video is upsetting for any car aficionado. My son was incredulous that anyone would willing destroy a car. (Again 5 year old here) Various pieces of the car wreckage are displayed on a long table in the adjoining room like archaeological finds. Hypercaine by Simon Birch, Gloria Yu, Gabriel Chan, and Jacob Blitzer. Sometimes you experience an emotional reaction just from simply looking at a piece of art, and with others the story behind it makes it much more impactful. 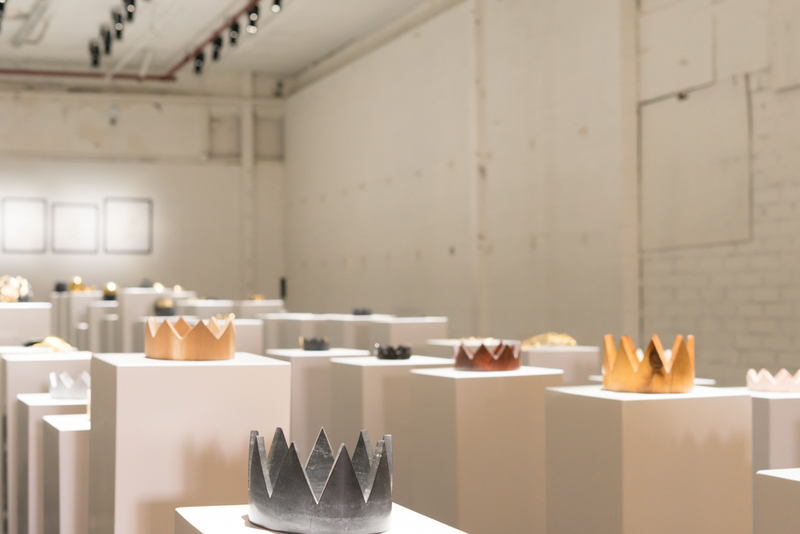 At first glance, this room had simplistic crowns made out of various stones and metal juxtaposed with more intricate Alexander Mc Queen like head pieces and some metal fragments. 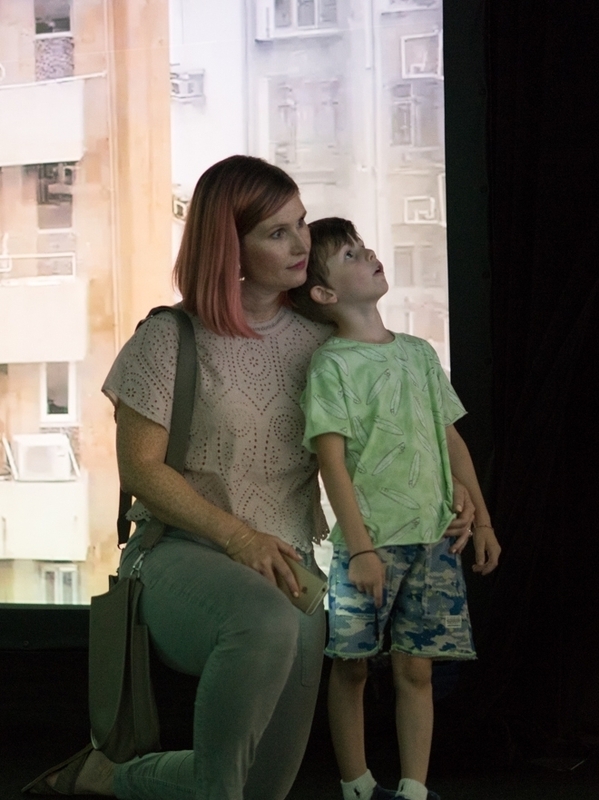 When chatting with the security guard, he explained that various pieces throughout the exhibit detailed the emotional journey that Birch embarked up on after being diagnosed with terminal brain cancer. Some pieces represent the chaos and turmoil of receiving such a grim prognosis. Others are more hopeful. The metal fragments and some of the metal cages were made from Birch's actual brain scans. This is also the room where a girl attempting to take a selfie recently fell backwards, knocking several of the pedestals down in a domino effect and causing $200,000 worth of damage. Its great when people can get right up close to enjoy and experience the artwork but it's a shame when people are careless and inconsiderate. Just because it's not a conventional museum viewing experience doesn't mean that the artwork shouldn't be treated with the same respect. One of my strongest memories living in Hong Kong was how crowded it was, with people and buildings. It made New York City look like a suburb. I was there in 1997 so I can only imagine what its like now, with the rapid pace of development. Hong Kong has so many of these drab high rise buildings shooting everywhere out of the ground up to the sky everywhere as far as the eye could see. Tannhauser gives the experience of riding upwards in a glass elevator outside these buildings as it goes from the ground floor up. Dizzying and electrifying, I really enjoyed it and you can see from the face of my son above, he did too! 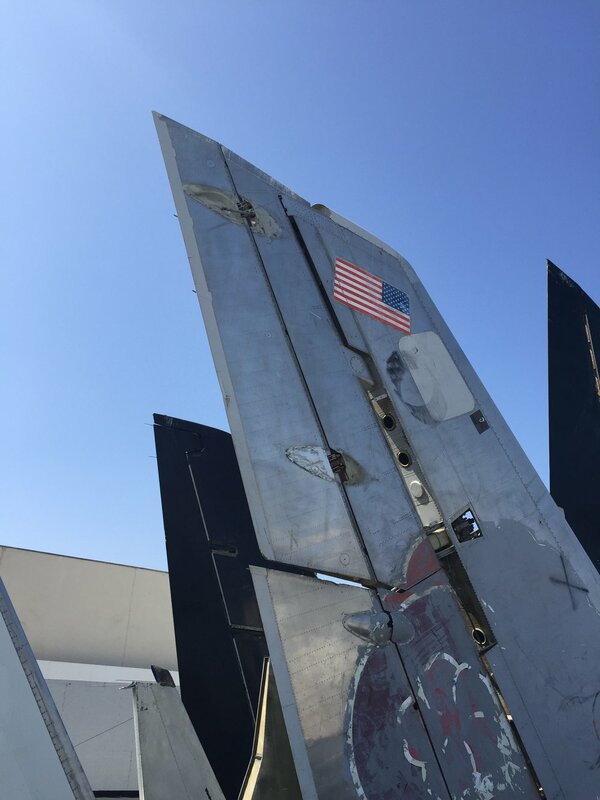 The last piece of the show is Clear Air Turbulence, which is comprised of salvaged airplane tails submerged in a steel frame pool. The shadows reflecting in the still water create a peaceful calm while the eeriness of the subject matter makes it slightly unsettling. The airplane tails seem like a scene of a giant plane crash. With the deck chairs circling one end its like pulling up a chair to a car crash. Voyeurism on steroids. 14th Factory closes July 30 with special events until then. A panel on the Art Experience and the age of Social Media is this Saturday, July 22 and Simon Birch will be tattooing various limited edition designs all day Saturday as well. Tickets are $18 online, $22 at the door with residents of Lincoln Heights entering for free with valid license. I love Palm Springs. I love that it's far enough from LA that it seems like a getaway while being close enough that you could go for a day if you wanted. I love the dry heat, the mountain views and the hot air blowing through the palm trees at night. I love the desert landscape, the modern architecture with its relaxed California lifestyle. 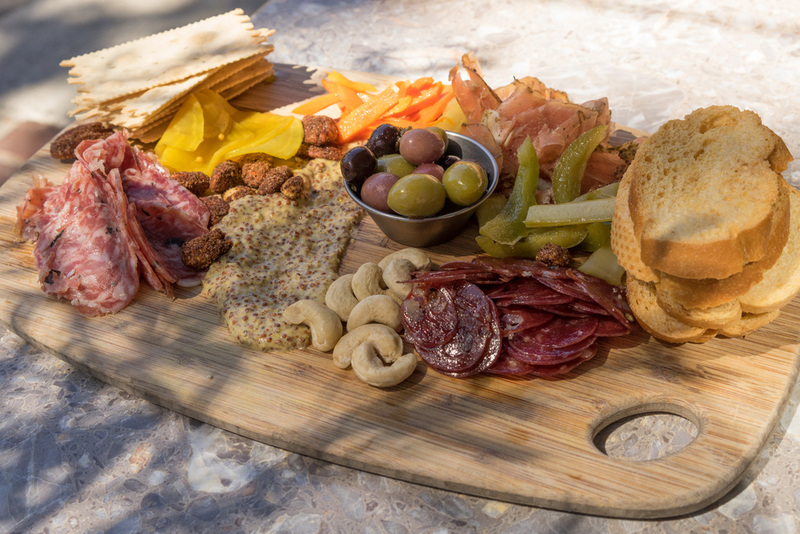 Palm Springs enjoys a history of being both a past favorite for Hollywood's glamorous like Frank Sinatra and Bob Hope back in the late 1930's yet is still relevant today. I gave up on going to Coachella years ago, love the music but didn't love the crowds, dust and traffic. Now that I'm a parent, kid friendly adult activities are what I'm all about. When Desert X popped up on my radar, it seemed like the perfect combination of all things I enjoy most: art, nature, discovery and travel. I was not disappointed. I loved it and hope it becomes a yearly recurrence! Desert X is a two month long, interactive outdoor art installation located throughout the Coachella Valley. Its like a modern day treasure hunt! Not only did it expose me to some new artist's work that I wasn't previously familiar with but it introduced me to some parts of the Coachella Valley I didn't know very well either. When I come to Palm Springs, I usually rent a house or stay in a hotel and spend the entire time poolside with drink in hand. Desert X encouraged me to venture out and explore Rancho Mirage, Palm Desert and other cities that I had been so close to all these years but had never seen. Desert X is also free to the public, so there is no barrier to entry. It was great seeing entire families out with their kids enjoying and interacting with the art. First stop on Desert X, checking in at the Ace Hotel Palm Springs. Grab a program guide here and get on your way! There were 16 installations in all, both from local and internationally acclaimed artists. Ideally we would have been able to see them all but we had our son with us, and only 24 hours to do it in, so realistically we knew we had to be strategic before burning out. We started with the Jeffrey Gibson wind turbine at the Palm Springs Art Museum. Any visitor to Palm Springs is familiar with the famous drive in surrounded by all the wind turbines. A ready made object, the turbine is covered with the words: I AM ALIVE! YOU ARE ALIVE! THEY ARE ALIVE! WE ARE LIVING! It also has opalescent paint that shimmers in the sun and looks quite pretty with the palm tree background. 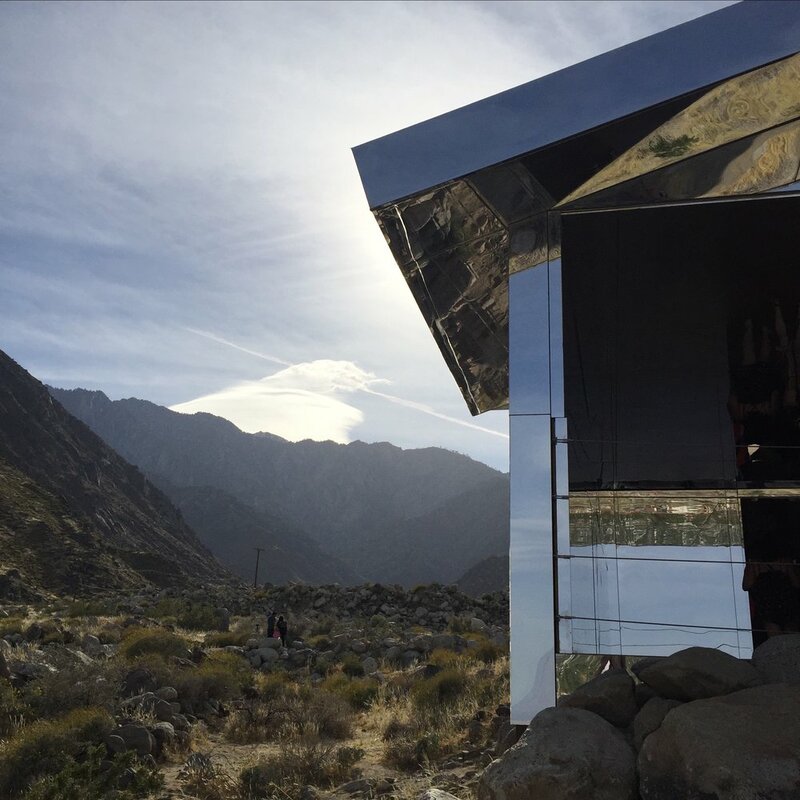 If you've seen an image of Desert X, it was most likely Doug Aitken's Mirage. It is the longest running of all the installations and the most permanent structure. It is a completely mirrored house, both interior and exterior. You simultaneously see your reflection along with the surrounding mountains sky and desert landscape. It's pretty incredible. As you walk through the maze like interior you see yourself and the other visitors and surrounding landscape from all angles, which is both an exhilarating and disorienting experience. The home is a suburban ranch style without any doors or windows, providing a seamless transition between interior and exterior. I went when it first opened at opens at 3 pm and there was a line snaking through the door. Because it reflects the surrounding landscape, its appearance changes depending on what time of day it is. I would love to go back at night and see it in the dark with all the lights twinkling on the valley below. While the rest of Desert X closes April 30, Mirage will remain open until October 31, 2017 so go!!!!! Next up, Swiss artist, Claudia Comte's Curves and Zigzags, is the third in a series of black and white optical painting walls. 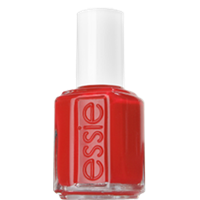 The lines start out angular and morph into a curvilinear pattern reminiscent of a Bridget Riley painting. As a kid, I was always drawn to black and white op art, getting lost in deciphering where the graphic pattern changed and evolved into something else entirely. The Homme Adams park is the perfect location for this undulating wall. It houses trails that lead to a vista where you can look down on the sculpture. Desert X also coordinated a walk with the artist herself, on the morning I was there. Dries had fun running around it and looking at the giant ants that were on the ground. Desert X is such a unique experience because it completely turns on its head the traditional notion of how one views art. It allows complete interaction between the viewer and the subject. I marveled at the lack of security, for the most part there were no guards securing the pieces with the exception of Mirage. The Richard Prince house was vandalized and subsequently closed which is a shame but I suspect that had more to do with the animosity towards his appropriation of other artists work for his own profit rather than general vandalism. I was impressed that there was no graffiti or trash surrounding the works. I did notice the influx of bloggers that were posing with the wall, some even by putting their feet up on the walls they leaned back on it. I wonder, why shouldn't the same rules of decorum apply to an outdoor work as would a piece of art hanging in a museum? Just because someone isn't standing there to tell you not to do it doesn't mean you should. It made me think, is this the new way we interact with art? I do see the value in as many people interacting with art in their daily lives but fear people ruining art installations with their own curiosity and desire to touch. Aerial photo of I am by David Blank. Last up for day 1 was Bahamian artist Tavares Strachan's piece I am. Unlike the other daytime installations, it's only open at night Weds-Sat from 7-10 pm. We visited at closing time and it was a surreal experience. You drive down a dirt road out in the middle of nowhere, turning into a dark field. You then wander down a longish path and see in the distance neon lights embedded in metal shapes cordoned off in a field. You have to sign a waiver to go in, since it is so dark you can hardly see anything except for the neon lights, adding to the element of anticipation and spookiness. The shapes spell out "I am" scattered throughout the desert floor spanning two American football fields. Meandering through the cutouts in the dark night with only the glow of neon and the desert wind blowing was pretty incredible. It creates a spiritual experience that is truly unlike anything I've ever seen. After a little time in the pool, we set off the next day for Phillip K Smith - The Circle of Land and Sky. Comprised of 300 polished stainless steel rods they are inserted into the sand at 10 degree angles in the shape of a circle. Reflecting the land and sky and the interplay of light and shadow, the resulting colors never look the same depending on the time of day and the angle of the sun. Like Mirage, it's fascinating to see the interaction of mirrored image with the Sonoran landscape. The reflectors bring the sky to the ground and the desert floor to the sky, creating a unique perspective. The Los Angeles born artist began the installation with a 1/4 mile arc in Laguna Beach in this past November and then continued the theme for Desert X. Will Boone - Monument Enter at your own risk! Last stop before heading back to LA, was Will Boone - Monument. It was out in the middle of a field, again usually easy to spot the Desert X installations by a swarm of people milling around in the middle of nowhere. We parked and waited in a short line to go down the bunker where JFK was waiting for us. I was surprised at how many people I had overheard the day previously at the other Desert X sites and this one who didn't know who it was! What I liked about this work was that it was more of a private moment than the other pieces and that it was meant to be experienced alone. 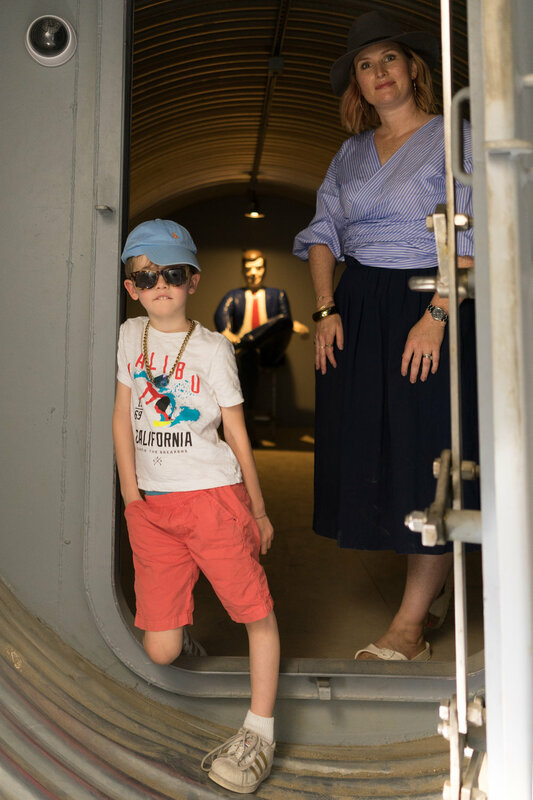 If you were the first one to arrive on site and it was closed, you texted or emailed for the pass code to the lock to the bunker, then swing open the hatch and down the stairs to a mini tunnel. JFK is a bronze statue painted in the style of a hobby kit. Hailing from Texas, Boone said he has always felt a connection to JFK being that was where he died. The bunker also touches upon the fear of nuclear attack and invasion of the other, something we as a society seem to be grappling with even in 2017. Desert X was such a memorable event, I really hope that it will become a recurring exhibition. 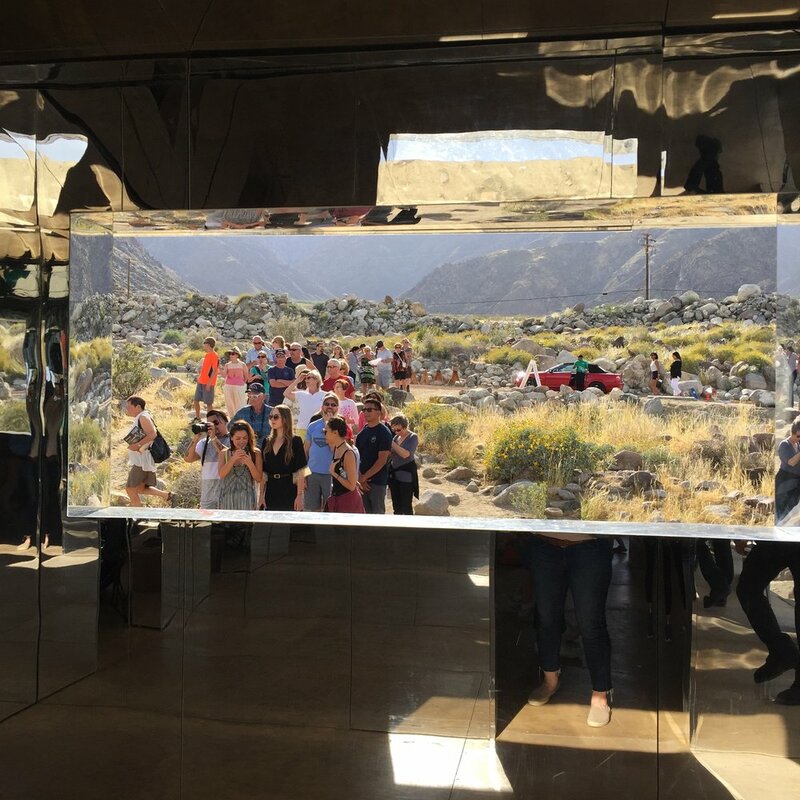 Even if most of the installations close today, Doug Aitken's Mirage is open until the end of October so you still have time to have some of the Desert X experience! I had heard about the super bloom of wildflowers in the California desert over the years but never thought much of it. Most likely because we have been experiencing a serious drought and for years there hasn't been much to see except brown, dry brush. This year though, we finally got some much needed rain, and lots of it (at least for us). 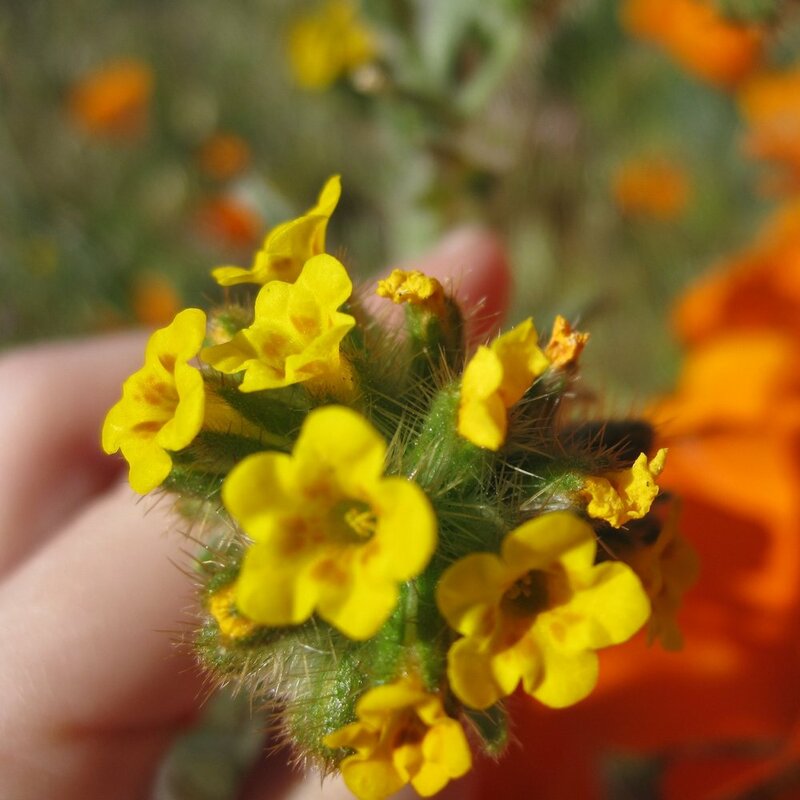 Spring came early for Southern California, the wildflowers have been exploding all over the place. I see them allover on my hikes and daily errands in the car along the roadside. I had heard reports from friends who had visited Anza Borrego and the Poppy Reserve that it was packed with people and traffic with long waits in the car. Neither are ideal if you are traveling with a 5 year old! I was looking for a little less of a commitment than A.B. or Death Valley since it was going to be just me and my son. My husband was off skiing for the day in Big Bear and I had a restless boy to entertain. I decided to chance it and set off early in the am, by 8 after an initial travel delay. After a 70 mile drive, (5 fwy to the 14 fwy) we arrived a little past 10 am, and already the line of cars was snaking down and out of the Poppy reserve half a mile down. I would recommend setting out by 7 am for a 9 am arrival for less traffic and best light. I had heard that wildflower gazing was best accessed from the side of the road and not actually from the reserve itself. Because the reserve is protected land, visitors need to stick to trails and not wander off into the fields. I decided to pull over and bypass all the people crowding at the road side and wander through into the fields and low and behold Dries and I were alone with the poppies. It was magical, a perfect day with perfect weather. The sky was blue, there was a little crisp chill in the air with a slight breeze and the sun was shining bright. We took care where we walked and were careful not to trample or pick any flowers. Dries took this of me, not bad for a 5 year old! Dries watches my husband Raf and I take a lot of pictures, either of jewelry or travel or daily life. We gave Dries one of our old cameras and he likes to practice along with us. This trip seemed like a great opportunity for a beginner photography lesson. We practiced composition, how to hold a camera and how to find your light source. He was so proud and it helped him learned to look more critically at the scenery. He took the picture of me above and the one below is his holding the flowers. Love the macro perspective with his little fingers! Had to take a ring selfie! Shown L-R my Sidewell ring, Diamond Bar ring, and my Diamond starburst ring. We found a farmhouse and a ramshackle old trailer that made for some good exploring. For the video, scroll down to the end! Dries was ready to get on the road at this point so we decided to head back to LA. As we walked back to our car, we saw even more cars had joined the line to get in the reserve and there was a line to head back to LA! I had noticed patches of yellow flowers on the way in so I wanted to make sure to check them out on the way back. I'm so glad I did, they were really stunning with views of the snow covered mountains in the distance. Snow covered mountains in the distance. The colors of all the wildflowers are just incredible. All the photos published here are all #nofilter and not retouched! Check out the video of our wildflower adventures! Hope you go out and have your own adventure and of course, remember to treat the wildflowers with care and not leave any garbage. It is a tricky thing to experience being in nature without affecting it at all in any negative capacity. Car exhaust, touching or trampling plants, garbage and human negligence all take their toll on the landscape. Instead of only viewing nature through the lens of a screen it's crucial to go have the physical experience of sight, sound and smell. How else can we teach our kids to care about the environment if they never experience it firsthand? Being a native of California, I love that within one hour, you can be swimming at the beach, skiing in the mountains or walking in the desert. We truly are so lucky to have such a varied landscape. Go out and explore, I'd love to hear what you find!